Brown coloured block-ends available in small (10, 20, 30 gr) medium (20, 35, 50 gr) and large (20, 35, 50 gr). The good choice of weighty base loadings offers great long-range casting potential. Filling takes place by swivelling the outer body to reveal an unusual square shaped side opening. The idea is to cram baits such as maggot inside and seal them in with some groundbait. Closing the opening doesn‘t work because the body perforations rather oddly close up, too! The internal wire link is also a bit strange, having a rather crude, twisted attachment eye, which looks tangle prone. Available in medium or large body sizes, each offering weight choices of 0.5, 1, 1.5, 2 or 3 oz. 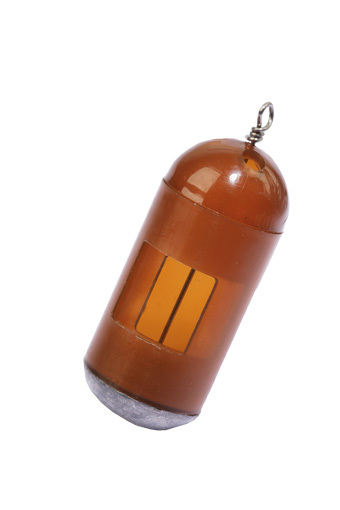 These base weight feeders cast serious distances, also featuring large bait escape holes and side fins designed to improve inflight stability. The latter are meant to prevent rolling in flowing water, too. 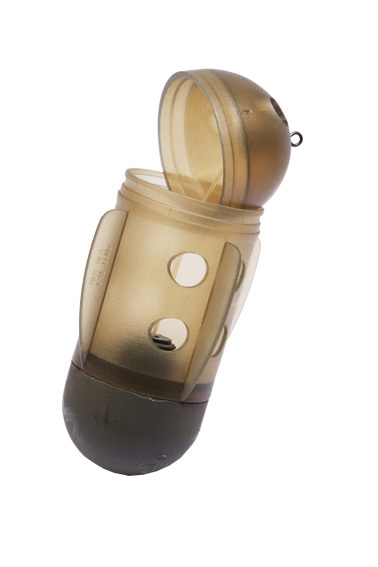 The filler cap is anchored with an internal powergum link, flipping over easily for fast loading. The base weight struggles to hold in powerful rivers. These sturdy brown block-ends come in small, medium and large – all with a choice of 28, 44, 60, 90 or 120 gr loadings. 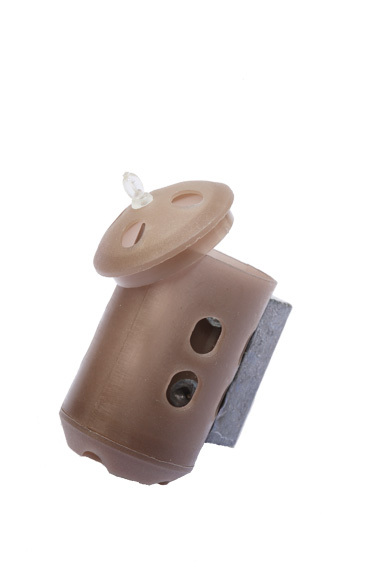 They have neat, unobtrusive internal powergum links with a moulded external attachment eye, to which a swivel link can be attached easily. The bodies have big perforations, which help release their contents quickly. The substantial flat base weights are riveted on and grip the bottom well in fast currents, also allowing good casting distances. 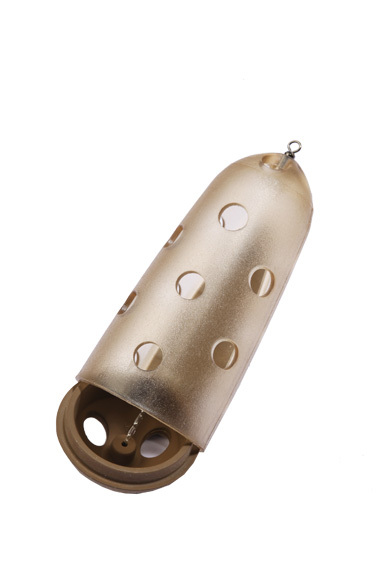 Streamlined feeders available in 12, 16, 22 and 30 gr sizes – in muted green or brown colours. These have swivels protruding from their leading ends, which are fixed to internal powergum links that also anchor on the base weight/filler caps. The latter flip over easily for filling and provide most of the casting weight, while there is a less weighty stabilising side weight. 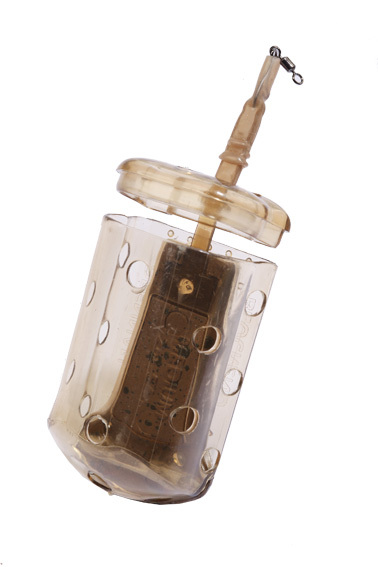 Feederbombs are probably the neatest and least complicated block-ends, which in turn results in trouble-free rigs. They suit stillwaters and slow-to-medium paced rivers. Available in green with 1, 1.5 and 2 oz loadings, also in brown with heavier 1.5, 2 and 2.5 oz side weights. Both sets come in small, medium and large body sizes. Oval shaped, they have tapering base weights and smooth body contours that hug the bottom in flowing water. 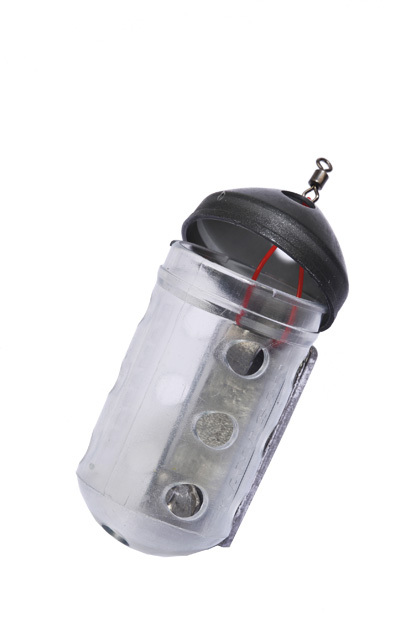 The bodies are well perforated, to make sure baits such as maggot and caster release fast, the filler caps swivel over easily for fast filling, and the silicone covered semi-rigid links have quick change swivel links installed. Mini, small and large sizes of these clear bodied block-ends, with their distinctive black caps, offer lots of different side weight choices – ranging from 10 to 50 gr. The soft plastic black caps pop open when side pressure is applied to their bodies, being anchored by internal powergum links. Only a small swivel is set outside for attaching to rigs. The flat side weights are integrated neatly into recesses in the bodies, keeping everything nicely streamlined. Blackcaps have been around for a long time; they are pretty basic, but still outperform all other designs when it comes to river fishing!